The Board of Trustees voted to make the student library fee an "opt-in" feature on tuition bills. Officials said the library department will receive an extra $300,000 next fiscal year to mitigate any negative effects. Officials plan to funnel thousands of dollars more into the budget for GW Libraries to compensate for an expected drop in revenue from student donations. The Board of Trustees voted last week to make the $100 student library fee an “opt-in” feature on tuition bills, rather than requiring students to uncheck the automatically ticked box to avoid the fee. Although officials hope students will continue making donations, a University spokeswoman said the library department will receive an extra $300,000 next fiscal year – an infusion of funding that officials anticipate will mitigate any negative effects from the change. University spokeswoman Maralee Csellar said officials have committed to a four-year plan to add a total of $675,000 to the library budget, beginning with $300,000 next year. 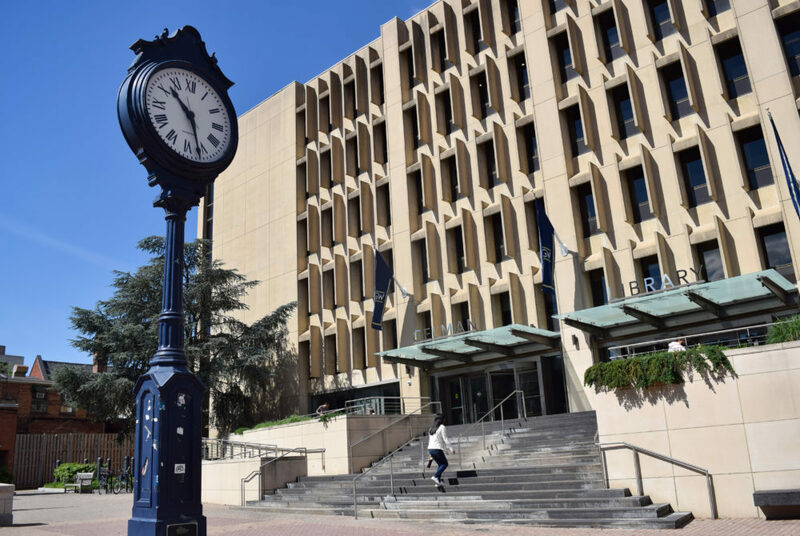 “With this plan, along with the gifts we receive, we are confident that students of GW who use and value library services, including its support for student learning and assistance, should make up the difference next year,” she said in an email. The library current takes in about $1.2 million from student fees – with about $350,000 going to programs and $850,000 for long-term projects and renovations, Csellar said. She declined to say what portion of the library’s budget is funded by student fees or what impact the new opt-in system will have on the number of students donating to the library. “The library gift has been an important source of funding for the Gelman and Eckles libraries since it was instituted in 1988. Without it, critical programs and renovations would not have occurred,” she said. But in announcing the switch to an opt-in system, officials acknowledged that the student fee was unpopular with the student body and not a sustainable way to fund the University’s library system. At a Faculty Senate meeting last week, University President Thomas LeBlanc said GW Libraries provides “fabulous” services for the University and shouldn’t be funded through a reluctant, optional gift from students. “We’re doing two things wrong. We’re telling people the library is optional and we’re nudging students in a direction they otherwise wouldn’t go, so we’re changing that,” LeBlanc said at the meeting. He said the option to give to the library will still be available, but funding for a resource crucial to the University shouldn’t be reliant on donations. Like all non-academic units, the library was asked in 2015 to slash its budget by 20 to 25 percent over a five year period. A faculty report found that the cuts have had a significant impact on library services compounding the issues posed by increasing journal prices and an already limited amount of space, especially in Gelman Library, which can only seat 6 to 7 percent of the student body at a time. Liz Konneker contributed to reporting. This article appeared in the February 15, 2018 issue of the Hatchet.